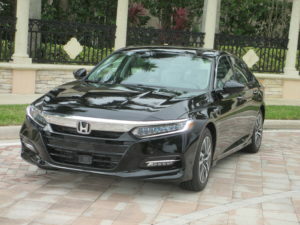 The 2018 Accord Hybrid is the latest addition to Honda’s growing portfolio of electrified vehicles. 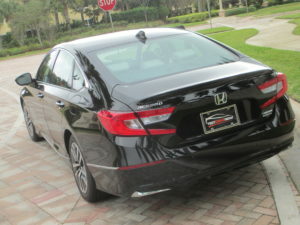 Boasting class-leading power, cabin space, and cargo space, the next-generation Accord Hybrid wholly embodies Honda’s unique approach to electrification – infusing fun-to-drive performance, efficiency, premium feature content, and comfort in a sophisticated and affordable package. 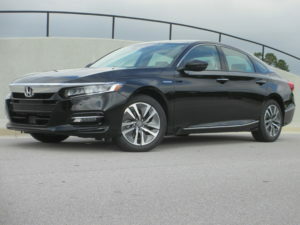 CLICK HERE TO WATCH STEVE HAMMES’ COMPLETE REVIEW OF THE 2018 HONDA ACCORD. 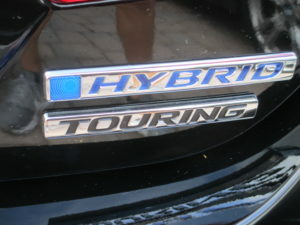 To suit a wider variety of hybrid sedan shoppers, the Accord Hybrid lineup now comes in five trim levels: Hybrid, EX (new), EX-L, EX-L Navi (new), and Touring. 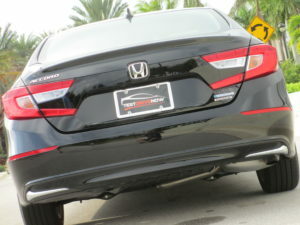 Better yet, the new Accord Hybrid is more affordable than ever thanks to a starting Manufacturer’s Suggested Retail Price (MSRP)1 of $25,100 (excluding $890 destination and handling), reflecting a $4,505 drop compared to the previous model. 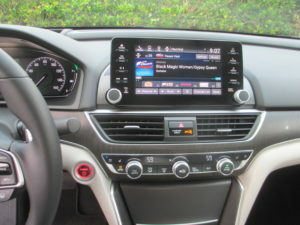 Smart entry with Push-button Start, a 7-inch TFT digital driver’s meter, a multi-angle rearview camera, and the Honda Sensing® suite of advanced safety and driver-assistive technologies, which bundles together Adaptive Cruise Control with Low-Speed Follow, Collision Mitigation Braking System™, Road Departure Mitigation, Lane Departure Warning, and Traffic Sign Recognition. 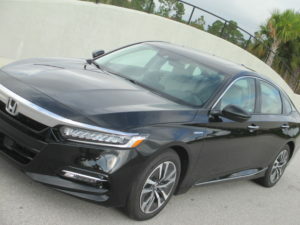 The 2018 Accord Hybrid is powered by the third generation of Honda’s innovative two-motor hybrid powertrain, which pairs a 2.0-liter DOHC i-VTEC® Atkinson-cycle inline-4 engine with 40-percent thermal efficiency to an electric propulsion motor that churns out 232 lb.-ft. of torque for a class-leading total system output of 212 horsepower. 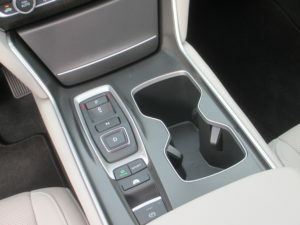 As before, the Accord two-motor system operates without the need for a conventional automatic transmission. 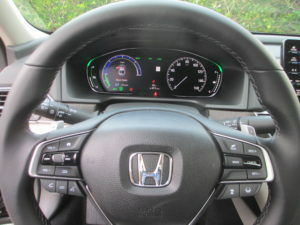 Helping to maximize energy generation are steering wheel-mounted Deceleration Selectors. 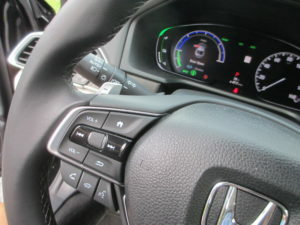 Similar to transmission paddle shifters, the Accord Hybrid’s Deceleration Selectors allow the driver to easily toggle between four levels of regenerative braking performance. 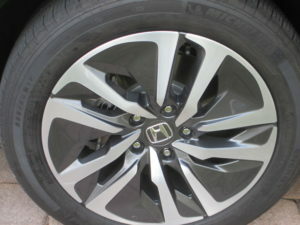 The right selector increases regenerative braking and the left selector reduces regenerative braking. 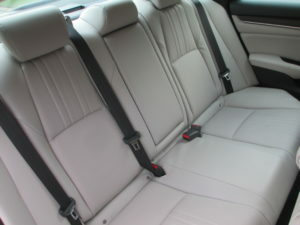 The system simultaneously helps reduce stress on the brakes while increasing battery charging via regeneration. 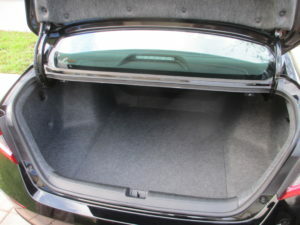 that is now mounted under the rear floor instead of in the trunk, allowing for the inclusion of a 60/40-split rear seat. 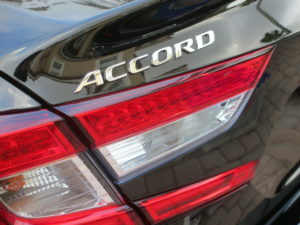 As a result, the Accord Hybrid provides the same people- and cargo-hauling space and flexibility as its conventionally-powered counterparts. Add it altogether and the 2018 Accord Hybrid delivers class-leading cargo space (16.7 cubic feet), interior space (122.3 cubic feet), and rear legroom (40.4 inches) all while reducing its overall footprint. 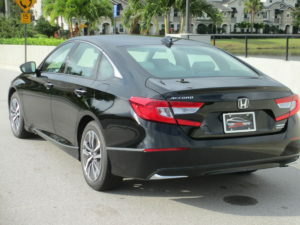 The new Accord Hybrid joins the Accord 1.5T and 2.0T in Honda’s all-new, award-winning 10th-generation Accord lineup. 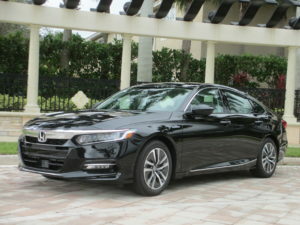 The new Accord has been called “America’s Best Sedan” by Car and Driver magazine, and in January was named 2018 North American Car of the Year. 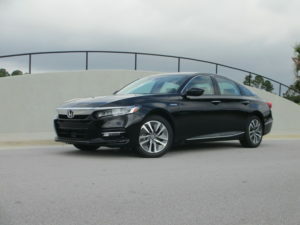 On the heels of claiming Kelley Blue Book KBB.com’s prestigious Overall Best Buy Award for 2018, the Accord has also earned a KBB.com Best Resale Value Award. 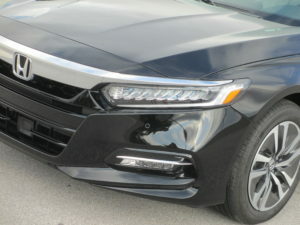 The 2018 Accord Hybrid for the North American market is manufactured using domestic and globally-sourced parts exclusively at Honda’s Marysville, Ohio auto plant4 alongside the Accord 1.5T and Accord 2.0T. 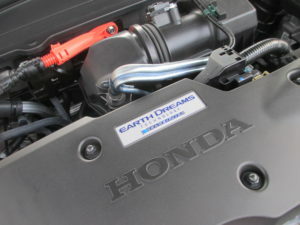 Its hybrid powertrain, including the 2.0L Atkinson-cycle, is produced at the nearby Anna, Ohio engine plant, Honda’s largest engine plant. 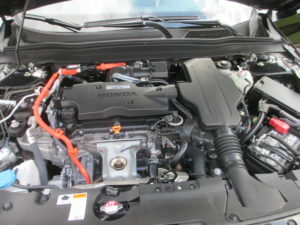 The intelligent power unit (IPU), containing the hybrid battery pack, also is assembled in the Marysville Auto Plant. More than 11 million of the 13 million Accords purchased by U.S. car buyers over the past 41 years have been made in America since Honda started U.S. automobile manufacturing in Marysville, Ohio in November 1982.